Have you been as busy as I have been lately? The summer months find me working on our garden, fishing, spending time up north, and just enjoying the beautiful weather. Finding the time to stamp can be a daunting task...but I found some time this past weekend, and I enjoyed every second of it. I've been playing with my new product, and I love it all! I've got another order coming today, and I can't wait to get working on projects with that, but for now, I've got an order to show you using a stamp set I won at On-Stage this spring...Wood Words! 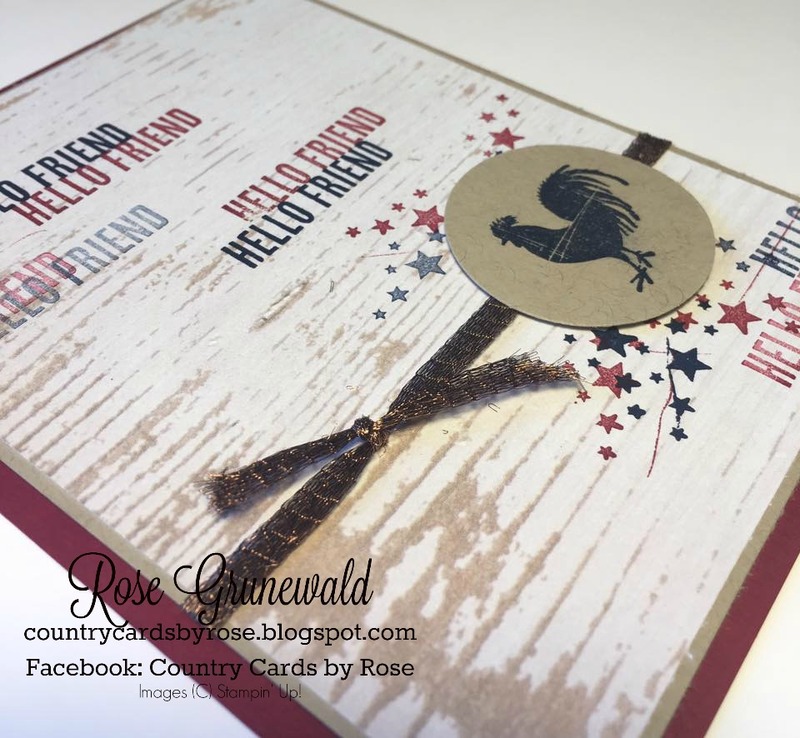 I love the Wood Words stamp set...as soon as I saw it, I thought "country". It's just one of those beautiful sets that's really versatile, and it pairs so well with the Wood Textures Designer Series Paper, which is what I've done with this card. 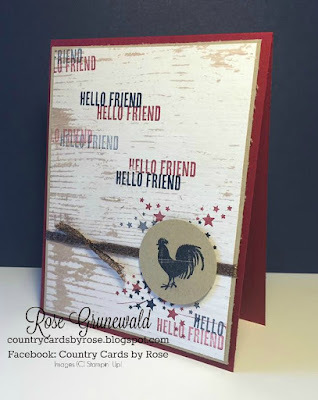 Stamp the rooster in Night of Navy on a Crumb Cake scrap and punch out using circle punch. Use the punched piece on your card front as a placeholder to determine where to stamp the stars and sentiment. In Night of Navy and Cherry Cobbler, stamp the stars so they will peek out from behind your punched circle. Stamp off for varying shades of both inks. Stamp Hello Friend sentiment in Cherry Cobbler & Night of Navy across the front of your DSP piece. Stamp off for varying shades of ink. Adhere the stamped DSP to your Crumb Cake Layer & tie Copper Trim around forming a bow or knot on the front (I formed a knot). Adhere the rooster circle to the front of the card with dimensionals. Adhere card front layers to card base with dimensionals. Stamp the inside of your card if desired. I love using DSP to make a simple, but beautiful card. This one came together in no time at all, and what a great card to have on hand for those "just because" occasions.